For complete overview of all S-Class models, see Mercedes-Benz S-Class. The Mercedes-Benz W140 is a series of flagship vehicles that were manufactured by the German automotive company Mercedes-Benz from 1991 to 1998. On November 16, 1990, Mercedes-Benz unveiled the W140 S-Class via press release, later appearing in several February and March editions of magazines. The W140 made its public debut at the Geneva Motor Show in March 1991, with the first examples rolling off the production line in April 1991 and North American examples on August 6, 1991. Short (SE) and long (SEL) wheelbase sedans were offered initially, as well as the coupé (SEC=S-Klasse-Einspritzmotor(Fuel injection engine)-Coupé) body style C140 from October 1992. Like all Mercedes-Benz lines, the W140 S-Class was rationalized in late 1993 using the new "letter-first" nomenclature. The SE, SEL, and SEC cars were renamed the S-Class, with alphanumerical designations inverted. For example, the 500 SE became the S 500, and the 500 SEL became the S 500 L. In 1996 the coupé models following a mid-life update were separated into the CL-Class. The W140 series S-Class was superseded by the W220 S-Class sedan and C215 CL-Class coupe in 1999 after an eight-year production run. Mercedes-Benz built 432,732 examples of the 140 series, comprising 406,710 sedans and 26,022 coupés. As with its predecessor, the W140 was the first of the "next generation" of Mercedes-Benz models to feature the company's new design theme. This design was adopted for the new C-Class in 1989 and during 1991 for use on the facelifted W124 in 1993. Development on the W140 began in 1981, originally set for an October 1989 production start. From 1982 to 1986 several designs were reviewed, until December 9, 1986 when a definitive design by Olivier Boulay was approved. Several prototypes were tested onwards from early 1987 and the final production exterior design was frozen in September 1987, with domestic design patents being filed on February 23, 1988 and U.S. patents six months later on August 23. The design was said by lead designer Bruno Sacco to be influenced by Jaguar's XJ40 sedan and BMW's E32 7-Series. Before production started, the exterior appearance of the W140 was revised in the form of the grille on all W140s being recessed as opposed to a planned exclusive grille on the top model, a feature which later spread to the rest of the Mercedes-Benz range. In 1987, an 18-month delay was made from 1989 to 1991 to accommodate a V12 engine and a high-performance braking system. This resulted in the final development prototypes being completed in June 1990. Pilot production models were made from June 1990 to January 1991. The W140 introduced innovations such as double-pane window glazing, power-assisted closing for doors and trunk lid, electric windows which lowered back down upon encountering an obstruction, rear-parking markers which rose from the rear wings (discontinued on later vehicles, and replaced with sonar-assisted parking) and a heating system which, if desired, continued to emit warm air after the engine was turned off. For details like this, the W140 is often known as the last Mercedes to be "over-engineered," a Mercedes trait that was costing the company in product delays and overbudgeting. According to Motor Trend, this action reportedly caused project cost overruns and resulted in the departure of Wolfgang Peter, Daimler-Benz's chief engineer. The vehicle is believed to have cost Mercedes-Benz over $1 billion to develop. For the consumer, the W140 cost a considerable 25 percent more than its predecessor, the W126. The W140 was to feature air suspension as an option, but it was dropped shortly before launch because Mercedes was still perfecting the technology at the time. Mercedes chose to launch air-suspension (AIRMATIC) in the next generation S-Class in 1998. The W140 instead used a rear hydropneumatic suspension, first introduced on the W116 450 SEL 6.9 (introduced in 1975) to be used on the S 500 and S 600 models. Following the mid-year facelift in 1995, Mercedes-Benz made Electronic Stability Control an optional fixture to both sedan and coupé body styles in the W140 range. Both the sedan and coupé body styles were equipped with Acceleration Slip Regulation (ASR) traction control as a standard feature on V8 models after the 1994 model year (V12 models always had ASR standard), and then the 1997 model year for I6 models. Like its predecessor, the car was available in two wheelbase lengths (short W140 and long V140) along with the C140 coupé. In 1991, a new M120 6 litre 402 horsepower V12 engine joined the lineup for the first time with the 600 SEL and 600 SEC. A "V12" badge was affixed to the C-pillar. In 1993, the 402 horsepower ( 408 hp Europe ) V12 engine was slightly detuned to 389 horsepower to comply with tighter emission control regulations in the United States and Europe. The V8 models were tuned down from 322 horsepower to 315 horsepower. This de-tuning, among other changes, involved the deletion of the full-throttle enrichment circuit, which reduced output by 7 horsepower. The W140 600 SEL was available with wooden rear ash tray covers, wood/leather shift knob, leather dashboard and a suede headliner, unlike the V8 and inline 6-cylinder models. Following the facelift in 1994, the S 600 was updated with a wood/leather steering wheel, a V12 badge on the wood/leather shifter, double needle stitching all over the interior and two tone nappa leather seating – further distinctions from its lower rung siblings. In June 1993, as part of the new corporate naming campaign, the model range was renamed. This resulted in all SE and SEL models now being re-designated as "S", being followed by the numbering. In late 1991, after worldwide launch, work begun on improvements to the W140. By the end of 1992, final design changes were approved and later patented(application) on February 27, 1993, exactly 5 years after the original W140 design patent application in 1988. In March 1994, the updated models were unveiled at the Geneva Auto Salon and went on sale in April 1994 in mainland Europe and in other markets during the second half of the year. The clear turn signal indicator lenses on the front and new taillights were the most obvious change, as was the grille including a new and distinctive one for S 600s. Headlamps were fitted with separate low H7, H1 fog, and high H1 beam reflectors in 1994; pre-1995 models used an H4 bulb and H3 for the fog lamp. In April 1995, "Parktronic" replaced the parking guiders on the rear boot lid. In 1995, the two tone exterior appearance was made to be monotone, low-beam xenon headlamps were added and the rear indicator lenses became clear. The changes were later introduced in June 1996 as 1996.5 models in Europe and 1997 models in the United States. Height of the W140 production models varied between years (1992–94 W140 Sedan: 58.7 in; 1992–94 V140 Sedan: 58.9 in; 1995–96 W140 Sedan: 58.4 in; 1997–99 V140 Sedan: 58.3 in; C140 Coupe: 56.7 in; 1997–99 W140 Sedan: 58.5 in). The car gained unwanted attention when Diana, Princess of Wales and two others died in a car crash involving a S 280 model, in a Paris tunnel. The only survivor sat in the front passenger seat. The W140 S-Class introduced several safety innovations which have since become commonplace among many vehicles. Braking system. The V8 and V12 W140 models distributed more braking power to the rear wheels, increasing stopping effectiveness. In 1996, the W140 received Brake Assist System BAS, which engaged during emergency maneuvers to boost braking power to maximum. Electronic Stability Program (ESP) was introduced in 1995 on the Mercedes-Benz S 600 Coupé. ESP used on-board computers to improve vehicle handling response during difficult driving conditions. This was a Mercedes developed system, which has since been licensed to other manufacturers. Xenon High-intensity discharge headlights (low beam only) were introduced in 1995. Side airbags (pioneered by Volvo in 1994) and seat occupancy sensors were introduced in 1996. Automatic windscreen wipers with rain sensors were introduced in 1996. Double-paned soundproofed glass was a new S-Class innovation first fitted on the W140. This form of window glazing allowed for improved soundproofing, reduced condensation, and other insulation benefits. Electrically-operated exterior mirrors could be folded at the flick of a switch to ease driving in narrow spaces. 'Parameter steering' was a system which made low-speed driving easier by reducing the effort required to maneuver in speed-sensitive situations such as parking. Rear-parking markers, or guide rods. These rods extended from the rear corners of the trunk lid when in reverse, providing the driver with a guideline for rear maneuvers. In 1995, this system was replaced by the sonar-based Parktronic system which measured the distance of the bumpers to nearby obstacles. 12-way powered, heated front seats, with 3 setting memory functions and lumbar support. Windshield wipers w/heated washer system. Later models also included Rain-sensing windshield wipers. Electrically-operated automatic-dimming inside rear-view mirror that tied into the seat and steering wheel memory. Heated exterior mirrors. Later models also included auto-dimming driver's side mirror. Orthopedic seats were an expensive option from the factory but consisted of several different air cushions in the seat that the user can inflate and deflate to find the perfect driving position. Dual-zone climate control. Four-zone climate control on LWB models. Reclining and heated rear seats on LWB models. V12 models also have the four-place seating option, which allows fully adjustable rear seats, lumbar support and rear sunshade control. The center seat has been replaced by a burlwood center console, allowing a 2 + 2 seating format. The climate control system could be set to operate for 20 minutes after the engine had been turned off. Rear passenger illuminated vanity mirrors. Leather interiors and burl inserts (optional; standard for 500SEC/CL 500). In 1995 the S 600 Coupe became the first Mercedes car with GPS navigation system, designated Auto Pilot System APS. It featured CD-ROM maps and full color navigation display in the center dashboard. In 1997 the TELEAID emergency and tracking system was introduced in the US market. Also, developed with the car, a Bose sound system was available as an option. First introduction of CAN bus (5 CAN bus nodes). The W140 featured a newly developed front axle double wishbone suspension and a rear independent multi-link suspension. In 1991 the first generation of the ADS (Adaptive Damping System) (Skyhook-type suspension) was introduced. It adjusted the damping level of the shock absorbers to help stabilize the car during high speed driving, aggressive driving, or if the driver loses control of the vehicle. Became standard on V12 models and optional for V8 models. In 1996 self-levelling suspension was integrated with ADS, and hydropneumatic suspension became optional on V8 and standard on V12. The flagship model of the W140 lineup, the S 600 (600 SEL until 1993) LWB saloon set new standards of performance, the likes of which had never been achieved with such a heavy robust car up to that time. The S600 L served as the basis for the development of the Maybach 57 and Maybach 62 models sold by Daimler-Benz. In its mildest state of tune, the M120 6.0-litre V12 engine was capable of accelerating to 100 km/h in as little as 5.5 seconds and with a top speed of 179 mph (288 km/h) with the limiter removed. Mid to high range acceleration is immense and closely matches the first generation S 63 AMG model in this regard. Even today the S 600 is still popularly used as an alternative performance option to the newer, more expensive AMG models. There were available, a limited number of the 600 SEL model with an AMG aftermarket power pack upgrade, increasing the power output to approximately 445 PS (327 kW; 439 hp) with 623 N⋅m (460 lb⋅ft) of torque thanks to slightly more aggressive camshafts, pistons and connecting rods and a computerised remap of the original ECU. In addition, there was the even more powerful S 73 AMG that produced more than 500 PS (370 kW; 490 hp). However, these cars are all extremely rare as only 112 were made, all special orders, and all in black. It should be noted that the S 70 AMG had a slightly smaller engine than the Pagani Zonda and the SL 73 AMG. However, there were still some S 73 AMGs (all with C140 face) made with the Pagani Zonda engine. 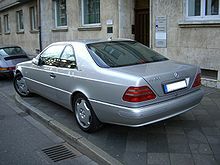 Wikimedia Commons has media related to Mercedes-Benz W140, Mercedes-Benz V140 and Mercedes-Benz C140. ^ "Press Release - Mitsubishi Motors Corporation". ^ Schröder, Christian. "Alles über die Mercedes-Benz S-Klasse der Baureihe W140" [Everything about the W140-series Mercedes-Benz S-class] (in German). ^ a b Kittler, Eberhard (2001). Deutsche Autos seit 1990 [German Cars Since 1990]. 5. Stuttgart: Motorbuch Verlag. ISBN 3-613-02128-5. ^ a b "DPMAregister - Designs - Registerauskunft zum Design". ^ MacKenzie, Angus (2007-04-17). "2007 Lexus LS 460". Motor Trend. Archived from the original on 2010-08-30. ^ "Princess Diana's death and the conspiracies that just won't die". ^ "Mercedes owners to get together on October 21 - Times of India". ^ "Top Speed W140 profile". Topspeed.com. Retrieved 2010-10-01. ^ "V12 Uber Alles, Diagnosing the Adaptive Damping System (ADS) in a Mercedes Benz S 600". V12uberalles.com. 2010-07-29. Retrieved 2010-10-01. ^ "S600 Speed Limiter Removal". Deutsche Autoteknik. Archived from the original on 10 November 2013. Retrieved 10 November 2013. Clarke, R.M., ed. (2007). Mercedes AMG Gold Portfolio 1983-1999. Road Test Portfolio Series. Cobham, Surrey, UK: Brooklands Books. ISBN 9781855207455. Häußermann, Martin (2006). Mercedes-Benz – The Large Coupés: The brochures since 1951. Archive edition of the DaimlerChrysler Group Archive. Bielefeld, Germany: Delius Klasing. ISBN 3768818330. Hofner, Heribert (1997). Die S-Klasse von Mercedes-Benz: von der Kultur des Fahrens [The S-Class from Mercedes-Benz: from the culture of driving] (in German). Augsburg: Bechtermünz Verlag. ISBN 3-86047-589-4. Jeanes, William. "Mercedes-Benz 300SE". Car and Driver (March 1993): 126–127. Kittler, Eberhard (2002). Typenkompass Mercedes-Benz Band 2. Personenwagen seit 1976 [Typenkompass Mercedes-Benz Volume 2. Passenger Cars since 1976]. Typenkompass series (in German). Stuttgart: Motorbuch Verlag. ISBN 3613022095. Larimer, Fred (2004). Mercedes-Benz Buyer's Guide: Roadsters, Coupes, and Convertibles. St. Paul, MN, USA: MBI Publishing. ISBN 0760318115. Pitt, Colin, ed. (2002). Mercedes-Benz W126 W140 W220. Hockley, Essex, UK: Unique Motor Books. ISBN 1841555150. Smith, Kevin. "Mercedes-Benz 500SEC". Car and Driver (March 1993): 45–49. Taylor, James (2009). Mercedes-Benz: Cars of the 1990s. Crowood AutoClassic Series. Ramsbury, Marlborough, UK: The Crowood Press. pp. 9–16, 52–72. ISBN 9781847970961. Mercedes-Benz Technical Companion. Cambridge, MA, USA: Bentley Publishers. 2005. ISBN 9780837610337. This page was last edited on 11 April 2019, at 04:20 (UTC).